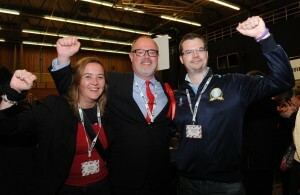 Eileen, Paul and Ashley pleased at the announcement of Paul Woodward being re-elected to represent Church ward for another 4 years. Councillor Paul Woodward and the rest of the Church Ward Labour team would like to thank residents for re-electing him for another 4 years. In a close election Paul and the Labour party polled 1555 votes beating nearest challengers the Conservative party by 237 votes. This means Councillor Woodward will be representing the people of Church ward for four more years and will soon be back out listening to your concerns! The next 4 years are shaping up to be a difficult time for local Government but Paul is determined that any changes are as fair as possible and with residents concerned fully taken on board. This entry was posted in Ward News and tagged local elections church ward on May 11, 2015 by Ashley Pearce.